Documentation and SupportV5 User Manual Using Fix (Table Grid View) ConfiguratorHow do I create a View Mashup Field? 1. Open the Configuration tool. 2. Type anything in the Field box and click the '+' to add a new field. 3. Find the new field in your list and click the wrench. 4. 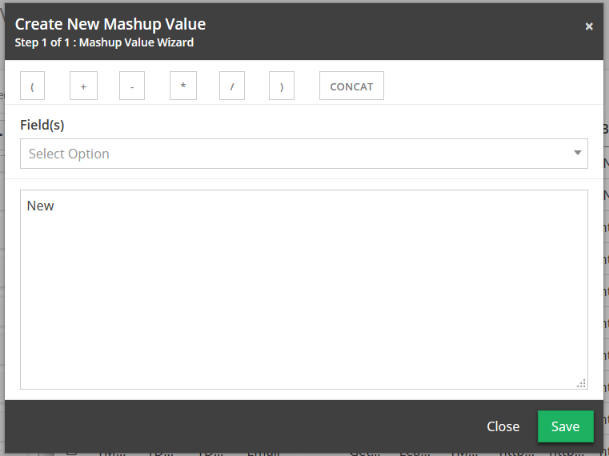 Click on the magic wand to open the Mashup Modal. 6. Enter what you would like to be in the Mashup field. This can be as simple as text or a number, or it can be custom SQL. Note: You can use any of the available options along the top, and you can use any of the fields in the drop down. If you are going to use plain text or a number, please be sure to use single quotes around your entry as shown below. The hit Save. 7. Run your view that contains your Mashup field. 8. Congratulations, your Mashup Field has been added! Prev: How do I change what is shown for a Field Name? Next: How do I Filter in Fix (Grid View)?